The Hardest Meal That I’ve Ever Cooked. This was one of the most difficult (and perhaps least successful) meals that I’ve ever cooked. Gareth and I had only been dating for a few months, so on Valentines Day 2010 I wanted to do something to impress him, so I decided to cook him a traditional Welsh roast dinner. A roast dinner is very common in Wales and throughout the UK and is when you roast a type of meat in the oven (lamb, pork, etc) and then serve it with roast potatoes and vegetables. I chose to make him lamb because he said that was his favorite. So, I began on my journey to cook this meal for him. I had never cooked a leg of lamb, so I called my local butcher and requested a de-boned leg of lamb. When I went to pick it up and saw the size of this lamb leg, I was astounded. I had no idea it would be so big! (The lamb in the photo was HALF of the whole leg I purchased.) Not only that, it was a fortune! So I took this hunk of meat home and began preparing dinner for Gareth. The lamb had probably been in the oven for about 1 hour when Gareth arrived at my apartment, and was far from cooked. Two, three, four hours later… still not cooked. As it got even later, I realized this roast dinner was just not going to happen that night. So we took it out of the oven and went to bed. 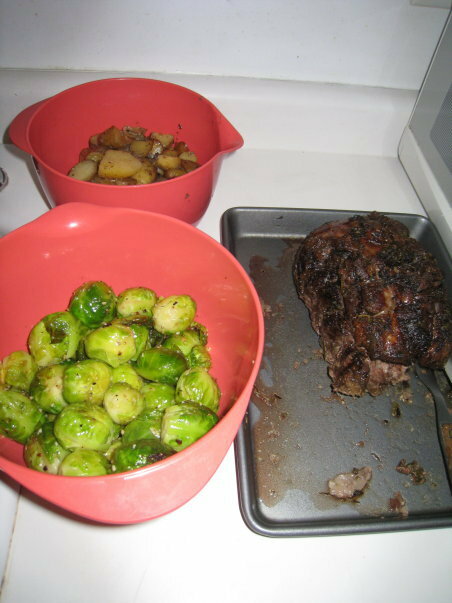 The next morning, we woke up early and put the lamb BACK in the oven, heated up the potatoes and brussel sprouts, and ended up eating the roast dinner for breakfast. That was the last time I cooked a leg of lamb. Maybe I should attempt it again for Valentines this year! Well, it sure looks good!! !